Current guidelines for the recruitment of prospective firefighters essentially preclude the employment of those with asthma; but suggest specialist referral in certain cases, with a possible role for bronchial challenge, such as histamine provocation testing. Disability discrimination legislation requires all applicants for a post to be assessed on an individual basis. We present the clinic experience of our specialist occupational lung disease clinic in the assessment of fitness to work for firefighter applicants from across the UK. In addition, new cases of asthma in current firefighters are assessed in order to determine any occupational precipitating or exacerbating factors. In the period 2000–8 48 firefighters were seen from 11 regional fire services. 43 were male, their mean age was 34 years. 24 (21 male, mean age 28 years) were referred for pre-employment assessment due to a history of previous or current asthma. Of these, 11, in whom there was some clinical suspicion of current bronchial hyperresponsiveness, underwent histamine provocation testing, of whom nine demonstrated a normal response (PC20 >16 mg/ml) and two had a borderline result (PC20a <16 mg/ml but >8 mg/ml). A history of “asthma” is currently a relative or absolute contraindication to employment as a firefighter; the evidence-base that this is necessary is weak. Nonetheless the impact of the recent large increase in the prevalence of childhood asthma is now having an effect on the prospective workforce. The development of evidence-informed guidance is underway to help to clarify the approach to these issues. Introduction and Objectives: It has been proposed that there is evidence of lower airways dysfunction even in non-asthmatic and non-atopic individuals with nasal disease. We have assessed lower airways function in patients with nasal polyposis. Methods: 72 patients with nasal polyps were assessed with spirometry, exhaled nitric oxide (FENO), nasal nitric oxide, body plethysmography, methacholine challenge, nasal aspirin challenge, total IgE and peripheral eosinophil count. Results: Three subgroups were identified (see table): “asthmatics” (pre-existing diagnosis of asthma); an “inflammatory” group (evidence of airways inflammation demonstrated by positive methacholine and/or FENO >30 ppb but no known diagnosis of asthma) and a “non-inflammatory” group (no history of asthma or evidence of airways inflammation). Both FEV1 and FEF25−75 were reduced in asthmatic compared with the inflammatory and non-inflammatory groups (p<0.005), but there was no difference between the non-asthmatic groups for either FEV1 or FEF25−75. Specific effective airway resistance (sReff) was increased in asthmatic individuals compared with the inflammatory (p<0.05) and non-inflammatory groups (p = 0.02), but there was no difference between non-asthmatic groups. FENO was not different between asthmatic and inflammatory groups, but both were elevated compared with the non-inflammatory group (p<0.005). Both total IgE and eosinophil count were higher in asthmatic individuals than the non-inflammatory group (p = 0.01 and p<0.005, respectively), but not significantly higher than the inflammatory group. 68% of asthmatic individuals and 20% of the inflammatory group were methacholine positive. 32% of the asthmatic group, 40% of the inflammatory group and 56% of the non-inflammatory group were aspirin sensitive in response to a nasal aspirin challenge. There were no differences in values between aspirin-sensitive and non-sensitive patients for any outcomes. Conclusions: Non-asthmatic individuals with nasal polyps have evidence of airways inflammation and subtle changes in airways resistance. Corresponding differences in blood IgE and eosinophils support the view that atopy is relevant to lower airway dysfunction and is suggestive of a spectrum of allergic airway disease rather than a “non-allergic unified airway”. Introduction and Objectives: Current asthma action plans are often unsuitable for ethnic and cultural groups with low rates of literacy in English and there is an urgent need to develop effective alternatives. Sylheti-speaking Bangladeshis in Tower Hamlets (TH) are one such cultural group. Sylheti is a dialect with no written form. Many Bangladeshis in TH have low literacy in both English and Bengali. 34% of the TH population is made up of the growing Bangladeshi community who face challenges to their health from a complex interplay of relatively low educational achievement, low income, high unemployment and overcrowded housing. We developed and distributed a simplified, pictorial-based English and Bengali asthma action plan via GP surgeries. We used qualitative methods to explore opinions and experience of the use of these plans among Bangladeshi-Sylhetis with asthma and healthcare professionals (HCP). Methods: Nine in-depth, face to face semi-structured interviews with a purposive sample of patients who had been given an action plan within the previous 8 weeks and had been taught how to use it. Two focus groups were held with HCP who distribute action plans in managing patients’ asthma. Data were tape recorded and transcribed and transcripts were analysed by repeated reading, identification and manual charting of emergent themes. Seven interviews were in Sylheti and translated by an interpreter, two were in English. Results: The majority of interviewees thought the new plan effective in reminding them what action to take during an asthma attack. All participants praised the innovative use of pictures in presenting the stages of an attack, improving understanding and message retention. There was a lack of understanding regarding the physical aspects of asthma and a consequent failure to grasp the prophylactic nature of steroid inhalers, thereby making self-management more difficult to promote. There was some disparity between the views of the HCP and the patients. HCP believed that action plans are discarded by patients—the majority of patients claimed to have re-read and referred to the pictorial plans at home. A recipient of other written plans said this was the “best out of all of them”. Mast cells contribute to the pathophysiology of asthma with the sustained release of both preformed and newly generated mediators in response to allergens and other diverse stimuli. Stem cell factor (SCF) is the key human mast cell growth factor, but also primes mast cells for mediator release. SCF expression is markedly increased in asthmatic airways. Short-acting β2-adrenoceptor (β2-AR) drugs such as salbutamol inhibit human lung mast cell (HLMC) degranulation in vitro in the absence of SCF, but in vivo this effect is rapidly lost, such that with regular administration of salbutamol, mast cell degranulation after allergen challenge is actually enhanced and asthma control may deteriorate. In this study we demonstrate that in the presence of SCF, the β2-AR agonist salbutamol is ineffective at inhibiting HLMC mediator release. In addition, in the presence of SCF and IgE alone, salbutamol actually potentiated mediator release in a dose-dependent manner. We also show that the Gαs-mediated coupling of the β2-AR with KCa3.1 was also lost rapidly after the addition of SCF. The addition of SCF to the HMC-1 mast cell line led to the immediate phosphorylation of Tyr350 on the β2-AR initiating uncoupling and internalisation of the receptor, which was evident at 10 minutes and maximal at 60 minutes. Therefore, we show for the first time a functional counterregulation of the β2-AR by direct cross-talk with the SCF receptor CD117. In summary, SCF attenuates the protective effects of β2-agonists on mast cell mediator release and KCa3.1 K+ channel function, and we suggest this involves phosphorylation of Tyr350 on the β2-AR leading to immediate receptor uncoupling followed by internalisation. In addition, when IgE is present, β2-agonists may actually potentiate mast cell mediator release. The potentially beneficial effects of β2-AR agonists in asthmatic airways may thus be blunted or even become harmful due to the high concentrations of SCF present. This provides further evidence that SCF is an interesting target for the treatment of asthma. Such a treatment strategy may not only attenuate many of the pathological features, but increase the effectiveness of currently existing treatments. Introduction and Objectives: Allergic asthma is characterised by Th2 inflammation in which mast cells play a central but undefined role. We and others have shown that ST2, the receptor for the novel cytokine IL-33, drives mast cell and Th2 lymphocyte activation. ST2 does not play a convincing role in models of experimental asthma that use immune adjuvants. Our aim was to study the role of ST2 in an adjuvant-free model of asthma, which may be more representative of clinical disease. Hypothesis: ST2 is a critical mediator of adjuvant-free experimental asthma. Methods: Wild-type (WT) and ST2 gene knock-out (ST2-/-) BALB/c mice were sensitised with ovalbumin with or without adjuvant (alum) prior to intranasal ovalbumin challenge. 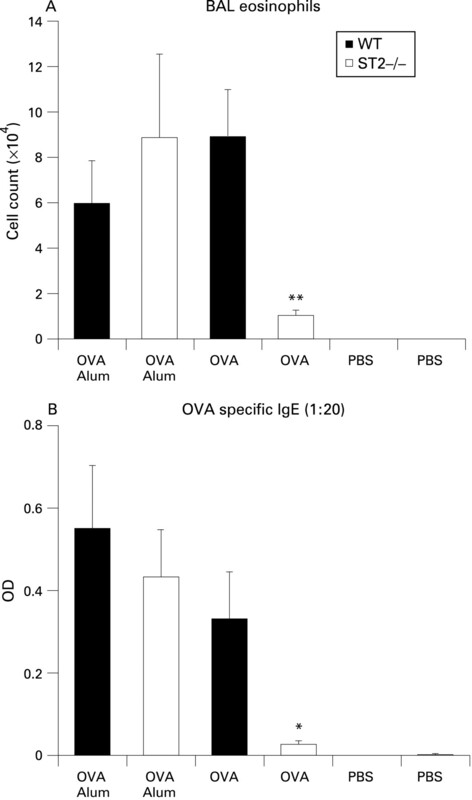 Control mice were sensitised with PBS and challenged with ovalbumin. Airways hyperreactivity was measured by Penh. To establish the importance of ST2 in airways inflammation the specific ligand, IL-33 (2 μg), was administered to WT and ST2-/- mice daily for 3 days. Differential cell counts were performed on bronchoalveolar lavage (BAL). Serum immunoglobulins were measured by ELISA. Results: In the alum-free model there was a significant reduction in BAL eosinophils in ST2-/- mice (1.0 × 104/ml) compared with WT mice (8.9 × 104/ml, p<0.005). In the alum model BAL eosinophilia was induced in both ST2-/- (8.9 × 104/ml) and WT mice (6.0 × 104/ml, p = ns; fig A). In the alum-free model IgE was absent in ST2-/- mice compared with WT mice (p<0.05). In the alum model there was an equally robust IgE response in both WT and ST2-/- mice (fig B). Airways hyperreactivity was induced in the alum-free model and this was unaffected by ST2 gene deletion. A role for ST2 in airways inflammation was supported by the finding that intranasal IL-33 induced a significant airways eosinophilia in WT (17.9 × 104/ml) but not ST2-/- mice (0.00 × 104/ml, p<0.01). Conclusions: Activation of ST2 in the airways can generate experimental asthma and ST2 appears to be crucial in an adjuvant free model, which may be more representative of clinical disease. This suggests that the ST2-IL-33 pathway may be an important therapeutic target. Introduction: IL-33 is a novel cytokine that binds to the ST2 and induces eosinophilia, Th2 cytokine expression and immunoglobulin production (Schmitz et al, Immunity 2005). ST2 is expressed predominantly on Th2 lymphocytes and mast cells. A role for T and B lymphocytes or mast cells in the response to IL-33 is unresolved. We have previously shown that IL-33 administered directly into the murine airway induces eosinophilic airway inflammation. We thus hypothesised that the administration of IL-33 to mice deficient in T and B lymphocytes or mast cells would result in attenuation of eosinophilia. Methods: C57Bl/6 RAG−/− (deficient in T/B/NKT lymphocytes), KitW-sh (deficient in mast cells) and wild-type (WT) mice received 2 μg of IL-33 or PBS intranasally for 3 consecutive days. The mice were killed 72 h following the final challenge. Bronchoalveolar lavage (BAL) was performed and differential cell counts obtained. 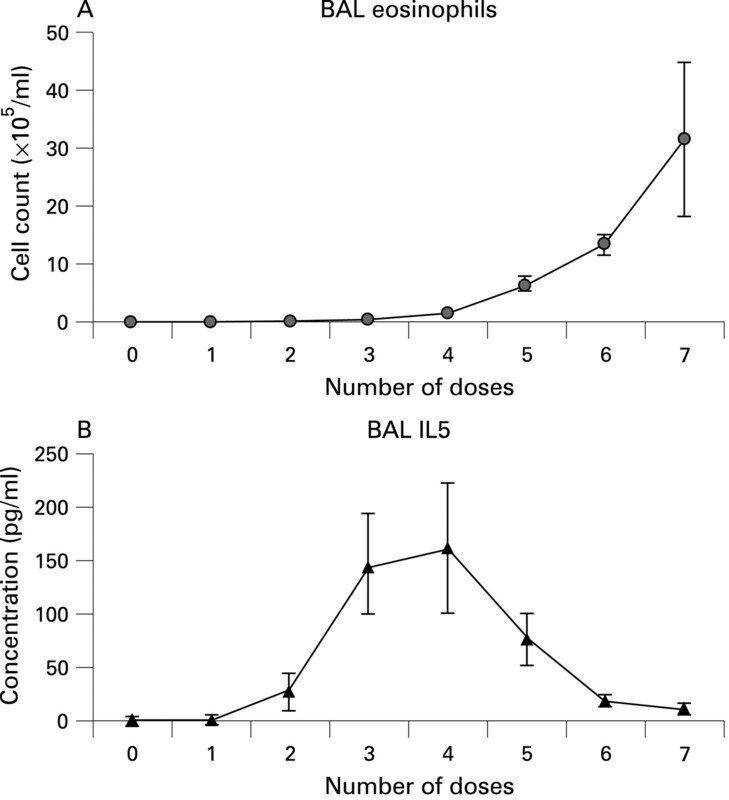 Cytokines and chemokines in the BAL supernatant were quantified by ELISA. Results: IL-33 induced an increase in BAL total cells and eosinophils in WT mice compared with mice given PBS (eosinophils 4.4 × 105/ml vs 0.02 × 105/ml). No significant difference was observed between WT and RAG−/− (3.35 × 105/ml) or KitW-sh mice (3.3 × 105/ml; fig). In addition, IL-33 induced increased levels of IL-4, IL-5, IL-13, eotaxin-1 and eotaxin-2 in the BAL of WT mice with similar levels seen in the RAG−/− and KitW-sh mice. Conclusion: Neither mast cells nor cells of the adaptive immune response are essential in IL-33 driven eosinophilic airway inflammation. Introduction and Aims: Allergic airway inflammation is characterised by eosinophilic infiltration. ST2 is a marker of Th2 lymphocytes and we have previously demonstrated that its ligand, IL-33, drives airway eosinophilia when administered intranasally to mice. IL-5 is an obligate trophic factor for eosinophils; however, its role in IL-33 driven eosinophilia is unknown. The aim of this study was to investigate the dynamic changes in airway inflammatory cell and cytokine profiles following repeated dosing of IL-33. We hypothesised that eosinophil accumulation is driven by local cytokine production. Methods: C57Bl/6 mice received an optimal daily dose of 2 μg of IL-33 intranasally for up to 7 days. Mice were killed 24 h following the final dose except in the case of mice receiving a single dose when mice were killed daily for up to 7 days. Bronchoalveolar lavage (BAL) and differential cell counts were performed. Cytokines in the BAL and serum were quantified by ELISA. Results: A single dose of IL-33 was insufficient to induce significant BAL eosinophil accumulation up to 7 days following administration. In mice given up to seven doses of IL-33, eosinophilic inflammation in the BAL appeared following the third dose. Eosinophil numbers continued to rise to a maximum of 31.52 × 105/ml (±3.1 × 105/ml) following seven doses (fig A). BAL (fig B) and serum IL-5 and BAL IL-13 increased to a peak following the fourth dose (161.8 ± 60 pg/ml, 194.68 ± 59 pg/ml and 776.4 ± 220 pg/ml, respectively) and fell to baseline by seven doses. Serum IL-13 increased over the time course to a maximum 613.9 ± 85 pg/ml following seven doses. No response was seen in ST2-deficient mice given IL-33. Conclusion: IL-33 mediated a dose, time and ST2-dependent increase in airway eosinophilia, the onset of which coincided with peak production of IL-5. Thereafter, the eosinophilia continued to escalate despite a decline in IL-5. This suggests initial recruitment of eosinophils by IL-33 may be partly due to its ability to mobilise IL-5 but subsequent accumulation seems to be maintained by other trophic factors. Asthma is an important cause of morbidity. Particulate matter air pollution is known to worsen the symptoms and increase the use of medications. Macrophages present within the lung normally clear inhaled particles in addition to apoptotic inflammatory cells such as eosinophils. Macrophages from asthmatic children contain fewer particles in spite of living in highly polluted areas. Therefore, we hypothesised that the clearance of particles is not efficient in asthma, possibly due to a toxic effect that eosinophil proteins have on the macrophages. To investigate this further, quantification of eosinophil proteins within the macrophages is required. Lung macrophages were isolated and cultured from lung resections, whereas eosinophils were obtained from peripheral blood samples. Apoptosis was induced in the eosinophils through cytokine deprivation for 48 h before feeding to macrophages at a 4 : 1 ratio for 4 h. The eosinophil protein (ECP and EPO) content of macrophages from both lung and induced sputum samples was analysed by intracellular flow cytometry, immunofluorescence and cell lysis. Following co-culture of the apoptotic eosinophils with the lung macrophages, the geometric mean fluorescence intensity of macrophages expressing ECP and EPO was 446.3 ± 33.1 and 781.2 ± 51.4, respectively, compared with 430.6 ± 347.4 and 458.9 ± 376.2, respectively, for macrophages cultured alone. This was also confirmed by immunofluorescence. Macrophages from induced sputum samples were shown to express levels of ECP and EPO that were above those of the isotype controls and macrophages cultured alone. Our data suggest that macrophages isolated from the lung are capable of phagocytosing apoptotic eosinophils; macrophages isolated from lung tissue contain varying quantities of ECP and EPO and macrophages from induced sputum contain eosinophil proteins. Therefore, we have successfully validated a range of methods to quantify eosinophil protein content in macrophages following phagocytosis, for use in further studies. Background: Non-asthmatic eosinophilic bronchitis (EB) and asthma are characterised by eosinophilic airway inflammation. The resolution of inflammation occurs by clearance of eosinophils by macrophages. We have observed eosinophilic staining and granules in macrophages in subjects with eosinophilic airway inflammation. This was used as a marker of previous eosinophilic inflammation and resolution. Aim: To compare induced sputum and bronchoalveolar lavage (BAL) macrophage eosinophilic staining in subjects with EB, mild asthma and healthy adults. Methods: Induced sputum (IS) and BAL cytospin slides from untreated subjects with EB (n = 6), mild asthma (n = 5) and healthy adults (n = 3) were analysed. Digitised images of 100 macrophages were captured (×1000 magnification). Image analysis software (Image J) was used to calculate cytoplasmic and the purple-red stained areas by using threshold for hue. The median percentage area of cytoplasm covered by eosinophilic staining (in pixels) was calculated and log transformed. Groups were compared using t tests and analysis of variance. Results: The sputum and BAL differential cell counts; eosinophilic area percentage is reported in the table. IS macrophages in EB had significantly higher eosinophilic staining compared with healthy individuals (p = 0.004) and with subjects with asthma (p = 0.047). There was no difference between mild asthma and healthy individuals in IS macrophages or between all groups in BAL macrophages (p = NS). Eosinophilic staining was significantly higher in induced sputum compared with BAL macrophages in EB and in asthma (see table). Conclusions: The eosinophilic staining in EB macrophages was higher than in asthma suggesting that the overall eosinophil load or the resolution of eosinophilic inflammation is different between these conditions. BAL macrophages had significantly lower eosinophilic staining compared with sputum macrophages consistent with the lower eosinophil count observed in this compartment. Background: Eosinophilic bronchitis (EB) shares many pathological features with asthma, including airway mucosal eosinophilic inflammation and mast cell activation. However, patients with EB do not develop the physiological abnormalities of asthma: variable airflow obstruction and bronchial hyperresponsiveness (BHR) to a direct bronchial challenge with methacholine. Patients with asthma also bronchoconstrict in response to indirect airway challenges, such as mannitol. Indirect challenges are dependent on the presence of airway inflammation and are positive in 10% of asthmatic subjects who have a negative response to methacholine. It is common in asthmatic patients with near normal lung function for BHR to methacholine to be normal while an indirect challenge is positive. As patients with EB have normal lung function and active airway inflammation, they might be expected to exhibit a bronchoconstrictor response to an indirect bronchial challenge. The aim was to investigate whether subjects with EB are responsive to mannitol. Methods: Subjects with asthma, EB and normal controls attended on two occasions. At visit one subjects performed a bronchial provocation test with methacholine (0.03–16 mg/ml). On the subsequent visit subjects had the mannitol challenge (5–635 mg). Each challenge was followed immediately by sputum induction for the measurement of airway inflammation and mast cell mediators. Results: 27 subjects were recruited (10 asthma, seven EB, and 10 normal controls). There was a significant difference in BHR to methacholine and mannitol between all three groups (p = 0.001 for methacholine, p = 0.002 for mannitol). No healthy controls or subjects with EB responded to methacholine or mannitol, whereas 9/10 and 7/10 subjects with asthma responded to the respective challenges. There was no significant difference in induced sputum concentrations of histamine or eosinophil cell counts following methacholine challenge compared with mannitol. Conclusion: The airways of patients with EB are not responsive to either direct or indirect bronchial challenge. This supports the view that it is the presence of functionally abnormal airway smooth muscle that is the key determinant of BHR in asthma, and that although this may be aggravated by the presence of mucosal airway inflammation, it is not caused by it. P117 ARE EXHALED NITRIC OXIDE MEASUREMENTS USING THE PORTABLE NIOX MINO® REPEATABLE ACROSS AGE, GENDER AND LUNG FUNCTION? Introduction: Exhaled nitric oxide (eNO) is a non-invasive marker of airway inflammation and so may play a role in the management of asthma. Until recently, eNO measurement required static, chemiluminesence-based NO analysers. A portable, hand-held NO analyser (the NIOX MINO®; Aerocrine, Sweden) is now available. To date only one study has validated this new analyser in a solely paediatric population. The aim of this study was to assess the reproducibility of NIOX MINO® measurements across age, gender and lung function (FEV1), in terms of both the absolute and categorical eNO values. Methods: Paired eNO readings from the NIOX MINO® were obtained in 494 teenagers aged 16–18 years (mean 17, SD 0.44) enrolled in a whole population birth cohort on the Isle of Wight and 65 children aged 6–16 years (mean 11, SD 2.7) enrolled in an eNO intervention study. Spirometry was also performed. Results: In the birth cohort participants, a Bland–Altman plot showed a high degree of variability between the first and second eNO readings in individual participants (mean intraparticipant difference 1.37 ppb, 95% limits of agreement −7.61 to 10.34 ppb), although a Kappa analysis showed close agreement between the two readings when eNO values were categorised as low (⩽15 ppb), medium (>15 to <25 ppb) or high (⩾25 ppb) (kappa 0.882, p<0.001). Similar findings were seen in subgroup analyses by gender, low and high FEV1 values and participants with asthma. Similar findings were also seen in the interventional study participants. Conclusions: The reproducibility of the NIOX MINO® is poor when considering the absolute value of eNO, but is acceptable when eNO values are categorised as low, medium or high, across the paediatric age range. Therefore, one NIOX MINO® measurement is sufficient when using categorical eNO values to direct asthma management. However, when using the absolute value of eNO, a mean of least two NIOX MINO® measurements is required. Introduction: Continuous or intermittent infusion of terbutaline is a treatment option in unstable severe asthma, but the main published evidence for its efficacy originates in small patient cohorts of short duration. Aim: To study the long-term efficacy of using continuous or intermittent infusions of terbutaline in unstable severe asthma. Methods: The available medical records of all patients who received terbutaline infusions at a severe asthma unit between 1980 and 2008 were retrospectively studied. We retrieved data on treatment indication, asthma subtype, patient demographics, pretreatment terbutaline trial outcome, duration of treatment and its effect on lung function, hospital admissions and oral corticosteroid requirement. Results: 42 patients were identified (31 female, mean age 43.6 years) attending the severe and brittle asthma unit who were currently receiving terbutaline or who had received terbutaline in the past including intermittent treatment. 37 of these patients had type 1 brittle asthma, one had type 2 and four were severe unclassified. These patients had a body mass index of 30.8 ± 7.8, a mean oral corticosteroid (OCS) dose of 27.4 ± 18.8 mg and a mean FEV1 % predicted of 66.8 ± 24%. 26/42 of patients underwent a double blind trial of which 23/26 were positive and three were borderline. The mean duration of treatment was 86.7 ± 65.4 (range 7–216 months). Objective measures were similar pre and on treatment with a mean FEV1 % predicted of 66.9 ± 24.0 versus 70.1 ± 28.1%, variation in peak flow rate (PEFR) 73 ± 22.7 versus 76.7 ± 26.0% and OCS maintenance dose of 27 ± 18.8 versus 24 ± 15.1 mg. There was also a reduction in mean hospital admissions, pre and when on treatment, 10.1 ± 13.4 versus 5.5 ± 10.8, respectively (p = 0.031). Conclusion: The study showed that the infusion of terbutaline had little impact on objective measures such as FEV1, PEFR and OCS but reduced hospital admissions in this cohort. Introduction: Continuous or intermittent subcutaneous or intravenous infusions of terbutaline are treatment options in unstable severe asthma, which may lead to disease stabilisation. Local side effects associated with subcutaneous infusions often lead to a switch to intravenous administration. The long-term safety/side effect profiles associated with both treatment models have not been published. Aim: A comparative study of the safety of intravenous and subcutaneous continuous infusions of terbutaline in unstable severe asthma. Methods: Patients with available records who received terbutaline infusion (TI) between 1980 and 2008 were studied retrospectively. Demographic information about asthma duration, severity and treatment were collated. Results: 42 patients (mean age 43.6 ± 11.4 years (range 19–68), 31 females) received TI (28 by the subcutaneous route and 14 by intravenous). The two groups (subcutaneous vs intravenous) shared similar demographics with a mean FEV1 % predicted of 66.3 ± 27.8 versus 68.6 ± 9.1%, a body mass index of 29.6 ± 7.6 versus 32.5 ± 8.1 and an oral prednisolone maintenance dose of 29.7 ± 21.6 versus 23.4 ± 12.2 mg. Complications due to the method of drug delivery were common in both groups, 12/14 experienced complications in the intravenous group; 8/12 had multiple problems (blockage, thromboembolic disease, septicaemia) and 4/12 had infections. In the subcutaneous group data were available for 13/28 patients; of these 6/13 had abscesses, 1/13 had dressing problems, 3/13 had multiple complications (abscesses, dressing intolerance, skin redness, nodules and bleeding) with a further 3/13 having other problems (rash, joint/muscle pain and site infection). Side effects to terbutaline were similar in both groups. Data were available for 13/14 of the intravenous group with 7/13 experiencing side effects. 3/13 suffered multiple side effects (cramps, tremor, palpitations, headache, tachycardia and raised creatine kinase; CK), 2/13 experienced raised CK alone, 1/13 had palpitations and 1/13 experienced tachycardia. In the subcutaneous group data were available for 25/28; of these 10 experienced side effects with 7/25 having multiple side effects (palpitations and raised CK), 1/25 had palpitations alone, 1/25 with raised CK and one had muscle pain. Conclusion: TI is associated with significant morbidity. The use of indwelling intravenous catheters for intravenous use is associated with more serious systemic side effects. Subcutaneous treatment appears safer but can still cause significant local side effects. Objectives: To compare the effectiveness of budesonide/formoterol (Symbicort) for maintenance and reliever therapy (SMART) with inhaled corticosteroid (ICS) plus short-acting β2-agonist (SABA) or alternative ICS and long-acting β2-agonist (LABA) regimens, including combination inhalers, plus SABA reliever for patients with established symptoms predominantly on steps II and III of the Scottish Intercollegiate Guideline Network and British Thoracic Society (BTS) guidelines. Methods: Meta-analysis of randomised controlled trials (RCT) using a fixed effects model. RCT were included if the comparator with Symbicort SMART had the same maintenance dose of ICS (Symbicort fixed dose), or at least double the maintenance dose of ICS (high-dose salmeterol/fluticasone, SALM/FP; high-dose budesonide, BUD; high-dose Symbicort fixed dose). The primary outcome was the incidence of severe exacerbations (oral glucocorticosteroid treatment for ⩾3 days, A&E visit and/or hospitalisation). Results: Of the seven RCT available from the Symbicort SMART clinical study programme, six met the inclusion criteria. The following comparisons were available: ICS alone (high-dose BUD, three trials), Symbicort fixed dose (Symbicort-FD, two trials), high-dose SALM/FP fixed-dose (two trials), high-dose Symbicort-FD (one trial). Meta-analysis of severe exacerbation demonstrated significant reductions with Symbicort SMART: 40% versus high-dose BUD (relative rsk (RR) 0.60, 95% CI 0.54 to 0.68, p<0.001); 41% versus Symbicort-FD (RR 0.59, 95% CI 0.52 to 0.68, p<0.001); 24% vs high-dose SALM/FP (RR 0.76, 95% CI 0.64 to 0.90, p = 0.002); 26% vs high-dose Symbicort-FD (RR 0.74, 95% CI 0.58 to 0.96, p = 0.02). Significant heterogeneity was not detected in primary analyses. Secondary analyses demonstrated reductions with Symbicort SMART: recurrent exacerbations (54%, p<0.001 vs high-dose BUD; 59% p<0.001 vs Symbicort-FD; 44%, p = 0.003 vs high-dose SALM/FP; 16%, p = 0.55 vs high-dose Symbicort-FD), hospitalisations/A&E visits (44%, p<0.01 vs high-dose BUD; 38% p = 0.001 vs Symbicort-FD; 32%, p = 0.0045 vs high-dose SALM/FP; 3%, p = 0.86 high-dose Symbicort-FD); use of oral steroids (41%, p<0.001 vs high-dose BUD; 42%, p<0.001 vs Symbicort-FD; 25%, p = 0.004 vs high-dose SALM/FP; 32%, p = 0.008 vs high-dose Symbicort-FD). There were significantly fewer withdrawals due to adverse events with Symbicort SMART compared with high-dose BUD (p = 0.005), Symbicort-FD (p = 0.007). Conclusions: Symbicort SMART is significantly more effective at reducing severe exacerbations in patients with established symptoms predominantly at steps II and III of the SIGN/BTS guidelines than a higher dose (2–4-fold increase) ICS and fixed-dose combinations. Introduction: Clinical responsiveness to a corticosteroid trial is an indication for regular therapy and is also predictive of significant underlying eosinophilic airway inflammation in corticosteroid naive patients with asthma. Clinical responsiveness is generally defined as an improvement in post-bronchodilator FEV1 of ⩾12% and/or clinically significant improvement in symptoms. Heterogeneity in the response of eosinophilic patients on therapy has not been investigated. We explored the clinical response to 2 weeks of oral prednisolone (0.5 mg/kg) in a group of 60 patients with refractory asthma and a history of eosinophilic airway inflammation. Methods: Patients had clinical assessment and performed spirometry, exhaled nitric oxide (FeNO50, Niox analyser) and had symptoms scored using the Juniper ACQ (JACQ) before and after the prednisolone trial. A subgroup also had bronchial wash and lavage performed at both visits. Sputum induction was performed at the first visit in all patients and at the second visit in patients undergoing bronchoscopy. Results: See table. 42 patients (70%) had a sputum eosinophil count >3%. 43 patients (71.7%) had a JACQ score of >1.57, indicating poor symptom control and 27 patients (45%) had post-bronchodilator FEV1 <80% at baseline. The table highlights marked heterogeneity in the clinical response to the prednisolone trial. 19 patients (31.7%) achieved the clinically significant improvement of −0.5 in JACQ score and 17 patients (28.3%) achieved a 12% improvement in post-bronchodilator FEV1. Elevated body mass index (BMI >28 kg/m−2) was associated with a significantly impaired response of symptoms to prednisolone (p = 0.02), independent of the baseline sputum eosinophil count. There was no difference in the degree of suppression of sputum, bronchial wash or lavage eosinophils between high and low BMI subgroups. Discriminant function analysis identified baseline FeNO (p = 0.03) and the change in JACQ score (p = 0.02) to be the only parameters predictive of sputum eosinophilia >3% at baseline. Conclusion: Corticosteroid responsiveness in refractory eosinophilic asthma exhibits marked clinical heterogeneity. Clinically significant improvements in either symptoms or FEV1 are only achieved in a minority, despite eosinophilic airway inflammation. Obesity is associated with significantly impaired corticosteroid responsiveness of symptoms, implying a multifactorial aetiology for symptoms in this subgroup. The BTS asthma guidelines advise that patients admitted with acute severe asthma should only be discharged when they have been stable on their discharge medication for 24 h and their PEFR is >75% of best or predicted (unless discharged earlier in agreement with a respiratory physician). Our unit has been running an early supported discharge scheme for selected patients admitted with acute asthma since 2000 with no evidence of an increase in adverse events. We have performed a 6-month prospective audit of outcomes of this scheme. Patients who fulfil the programme criteria are discharged with a nebuliser and written management plan and followed up by telephone or ward visit by a nurse specialist at 24–48 h and reviewed at the nurse-led clinic at 4 weeks. Patients are seen more frequently if required. Over the audit period 41 patients were admitted with acute asthma. 21 (51%) were discharged on the early supported discharge scheme. Sixteen (76%) of these patients fulfilled the definition of an acute severe attack and 24% a moderate attack. Fourteen (68%) of the patients were discharged within 24 h of admission, the remainder within 48 h. The mean FEV1 of patients at discharge was 54% of predicted (range 27–106%) and at follow-up 68% of predicted (33–115%). At the time of follow-up 61% had improved their FEV1 by ⩾20% while 20% had improved by ⩾40%. There were two readmissions within one month of discharge, one was inappropriate, the other a protocol failure. Our audit confirms our belief that early supported discharge of selected symptomatic asthma patients with suboptimal improvement in lung function is safe and feasible. Although this audit includes only a small number of patients it does reflect our practice over 8 years. There is limited evidence in the literature to support this practice (Lim TK et al. Respir Med 2000;94:1234–40) and a randomised controlled trial is warranted.